Hello everyone, this is Soundout from Herotaku and today as part of Collection DX's Super Review Wars DX! 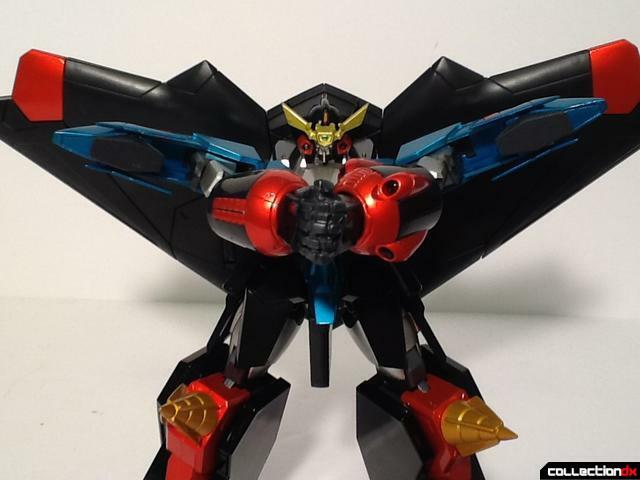 Today we will be taking a look at the latest release in the Super Robot Chogokin King of Braves GaoGaiGar line, which is none other than GaoFighGar from King of Braves GaoGaiGar FINAL. 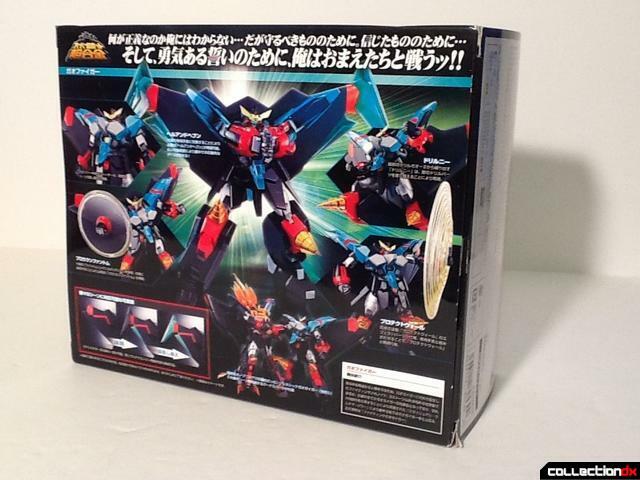 This release from Tamashii Nations was released in July 2014 at Japanese retail. It comes in a quite large and very nice looking box. 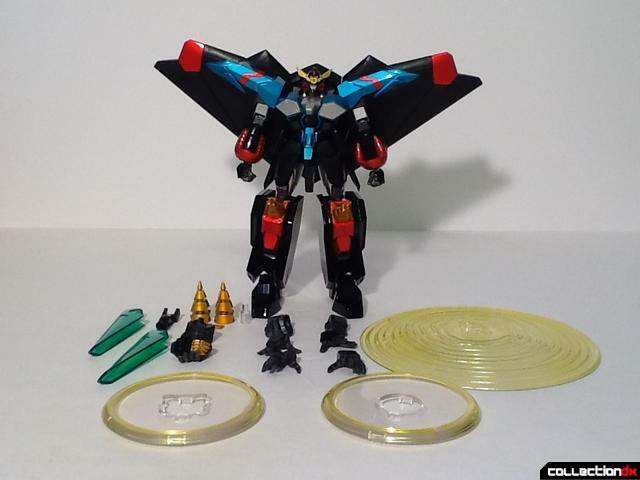 The figure itself is jam-packed with all kinds of accessories like any good SRC release. 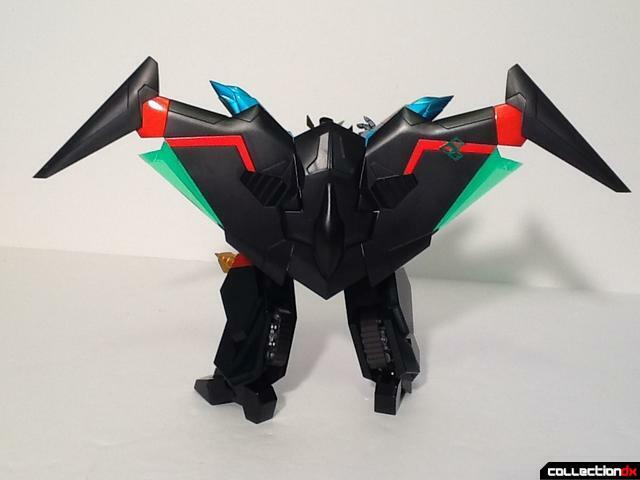 Included are multiple hands to replicate classic poses, alternate wing parts to replicate the flight position, Broken Phantom effects and a Protect Wall effect part. The figure also comes with a second head crest if you end up losing the first. GaoFighGar himself has a wide range of articulation to pull off any kind of pose that you would like. There are several hinges that help to move parts out of the way so that the joints have freedome to move. 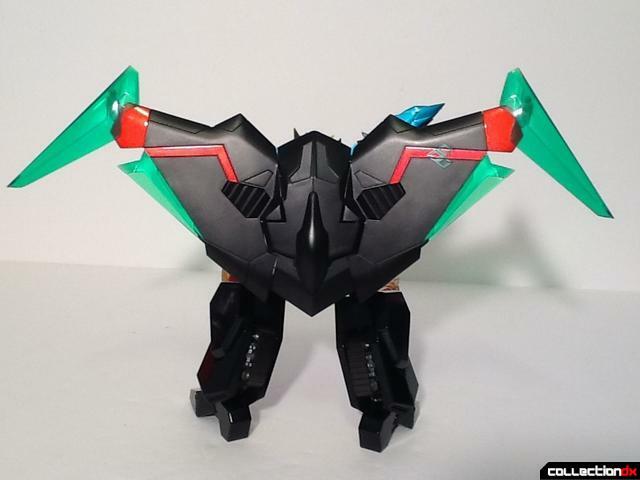 The wings even have the ability to hinge outward. 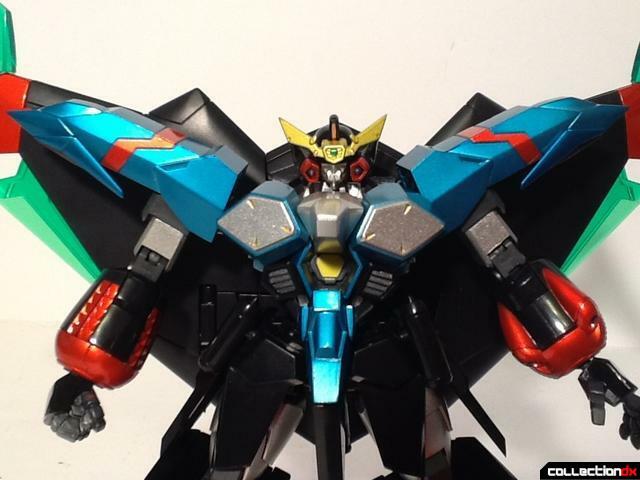 As mentioned previously, the wings include alternate parts to replicate the look of GaoFighGar in flight. The wings themselves actually have articulation in order to move from ground position to flight position. The black pieces had a very tight connection at first and it almost felt like the joint would break if detached wrong. The connection has loosened up after switching the parts a few times but it is probably the most fragile piece on the figure. 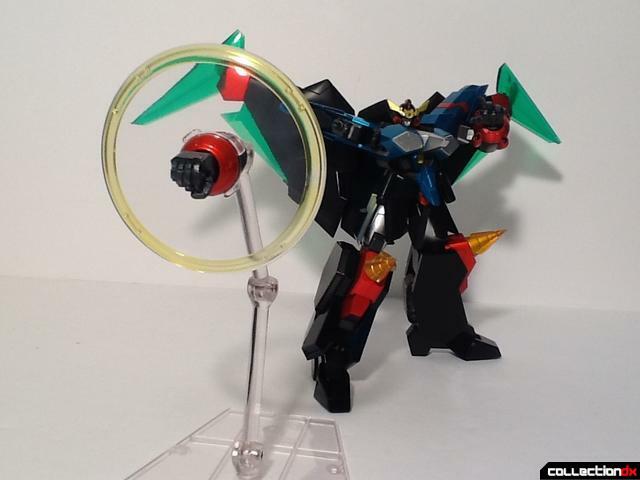 Like the previous GaoGaiGar releases, GaoFighGar includes a clip that attaches to the robot which allows it to be connected to a Tamashii Stage. The chest of GaoFighGar can also be opened up in order to properly display the Broken Phantom correctly. The Broken Phantom effect part is replicated well and the outer ring can be removed in order to display it in its pre-launch state. Unfortunately, the ring has no way of connecting to any Tamashii Stage connection, so it is unable to be displayed in any way. 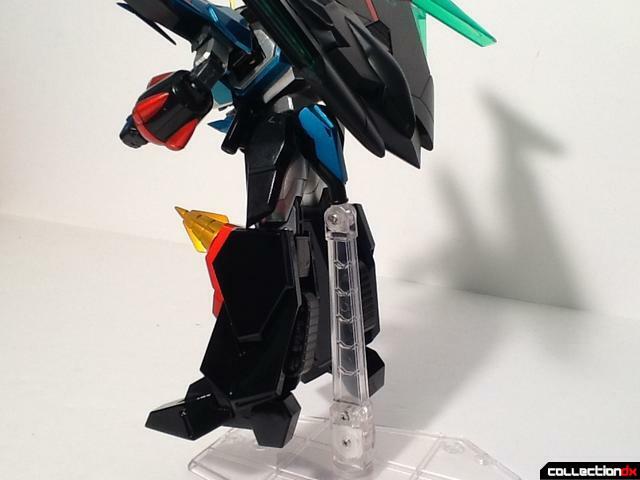 There is also a small peg included to mount the Broken Phantom to a Tamashii Stage arm for display options. 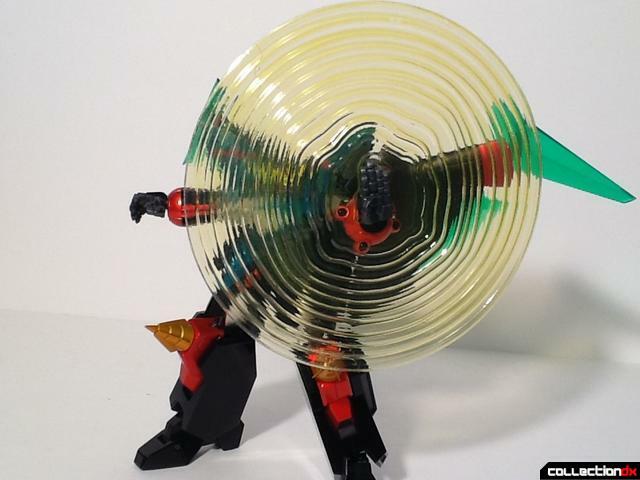 There is also a Broken Phantom effect for the left arm, but I cannot figure out when it was used in the series itslef so it is an accessory that did not need to be made, but it is appreciated. Speaking of unnecessary, but appreciated accessories, GaoFighGar includes two extended drills for his knee attack. They replicate the effect well and are a neat inclusion. In order to recreate GaoFighGar's signature defensive move, the Protect Wall, a really great looking effect part is included. Unfortunately, the plastic is kind of thin so be careful in order to not damage the piece. Just as with previous releases in the line, GaoFighGar includes a hand accessory to replicate his classic Hell and Heaven attack. Figuring out how to pose the figure correctly is tricky, but the end result is worth it. 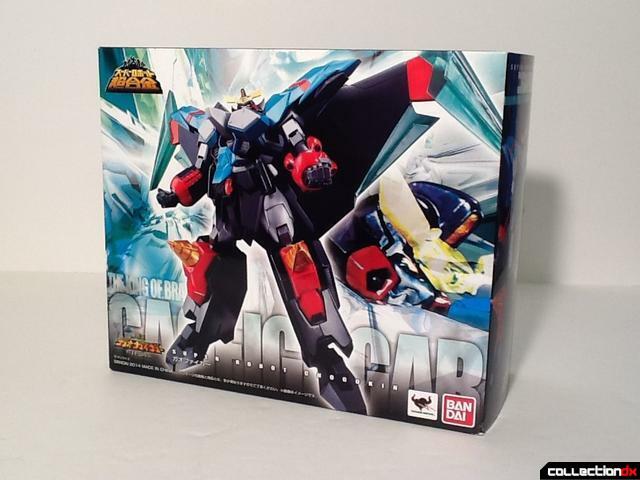 GaoFighGar is compatible with some previous Super Robot Chogokin releases, like the Key to Victory Set 1. 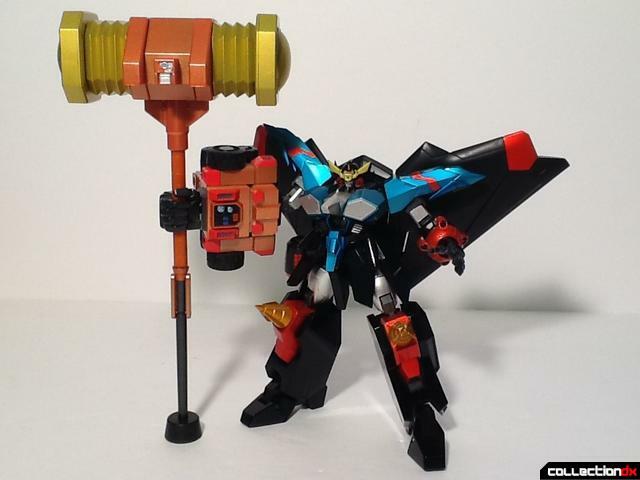 GaoFighGar is compatible with the Goldion Hammer but it is not as solid of a connection as the original GaoGaiGar figure. 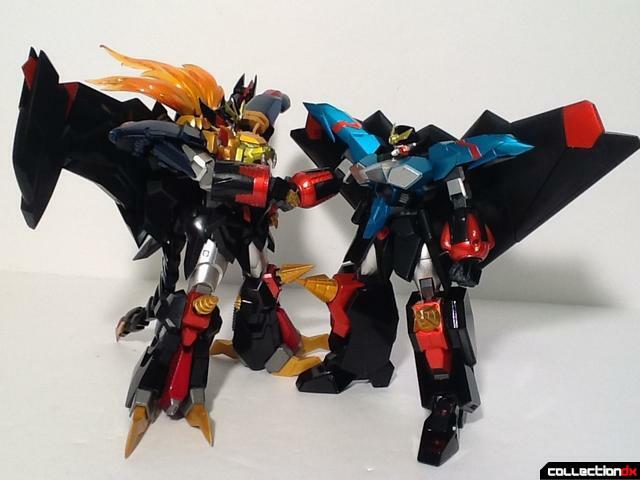 GaoFighGar also includes a pretty neat piece that allows GaoFighGar and Genesic GaoGaiGar to shake hands like they did in the second opening of GaoGaiGar FINAL. Overall, Super Robot Chogokin GaoFighGar is a spectacular figure. A ton of accessories give the figure many, many posing options and the detail is replicated perfectly from the anime it is based on. 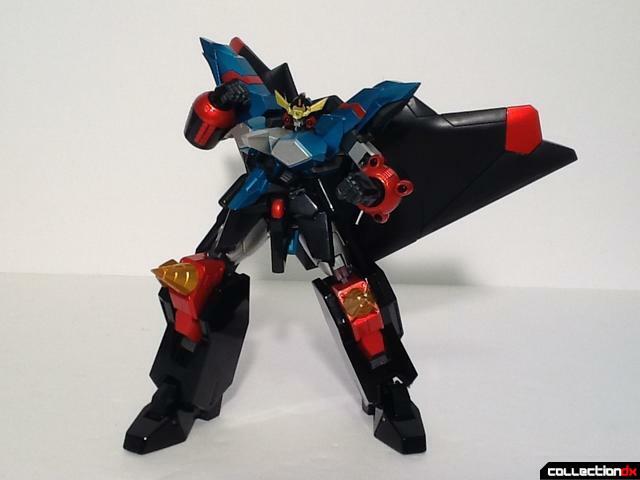 My only real complaint with the figure is the lack of his personal Dividing Driver, but that will be included with the upcoming Replicant GaoGaiGar figure. 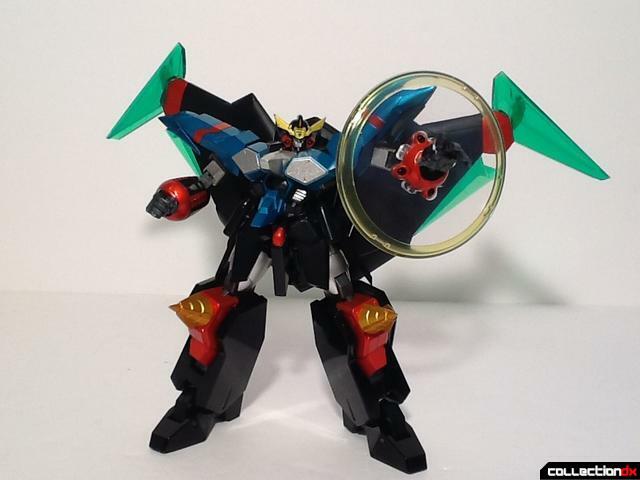 Overall, a solid release in the Super Robot Chogokin GaoGaiGar line. 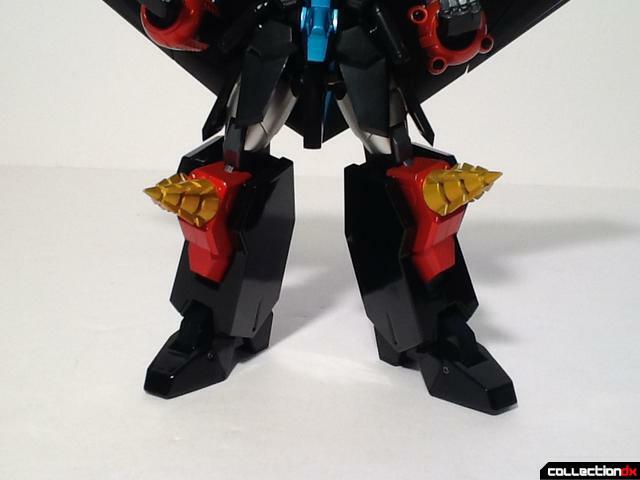 I can definitely recommend the figure to fans of the series and fans of cool robot toys in general. 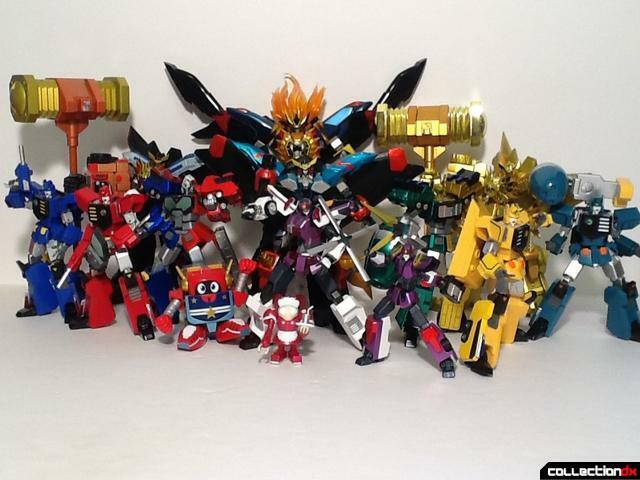 I can't wait to see what Tamashii Nations has planned for this line in the future. Until next time, this is Soundout from Herotaku saying thanks to Collection DX for this awesome crossover event! yeah, very sturdy, never worry about this guy to falling down. While I haven't tried putting them on a scale, by feel I think DaiGuard has a very slight edge in weight. But damn are both awesome for metal content and solid feel. Sadly my wingtips are on there so tight that I am fearful of changing them out to the trans green parts. Is there some magic secret for getting them off without breakage? A word of warning. Be very very careful with the Broken Phantom parts. I found after putting my right one on it very quickly started to develop hairline cracks around the center arm hole.